​Research in the Karron lab focuses on evolutionary processes in flowering plant populations. My students and I are particularly interested in understanding how plant mating systems evolve and how patterns of pollinator visitation influence male and female reproductive success. Our field experiments explore how ecological factors, such as the presence of co-flowering species, and heritable traits, such as floral morphology and floral display size, influence selfing rates and patterns of paternity in monkeyflower (Mimulus ringens). At our study sites in Wisconsin and Ohio Mimulus ringens is pollinated by several sympatric bumble bee species (especially Bombus fervidus, Bombus impatiens, and Bombus vagans). Through the use of genetic markers to unambiguously determine selfing rates and siring success, we have developed an unparalleled data set documenting fine-scale variation in plant mating systems. Our work has shown that selfing rates increase markedly with increasing floral display size, due to the effects of geitonogamous self-pollination (Karron et al. 2009; Karron & Mitchell 2012). Mimulus fruits are typically sired by 3-5 donors, and this high level of mate diversity results both from simultaneous deposition of mixed pollen loads as well as subsequent visits bringing in additional donors not represented in the initial visit (Karron et al. 2006). Sire profiles for 10 Mimulus ringens flowers visited either once or several times. Colors indicate different sires. Self sires shown in gray. Selfing rates of individual M. ringens fruits vary with the order in which flowers are visited on floral displays (p<0.000001) (Karron et al. 2009). Based on unambiguous assignment of paternity for 20 seeds per fruit. Does the presence and abundance of a co-flowering species change the pattern of selection on the mating system? A major conceptual challenge for evolutionary theory is the frequent occurrence of intermediate rates of self-fertilization in flowering plant populations. This pattern in nature is not consistent with classical genetic models, which predict that disruptive selection will cause intermediate selfing rates to be rare and transitory. 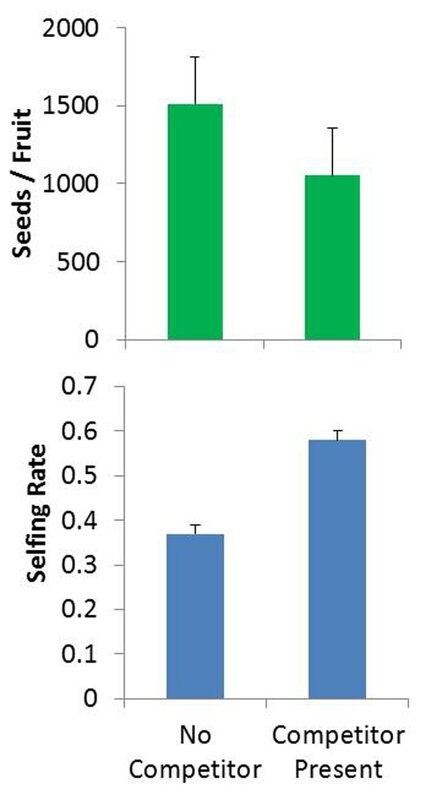 Populations with low inbreeding depression should evolve predominant selfing because more maternal alleles are transmitted through self-fertilized seeds than through outcross seeds. By contrast, populations with high inbreeding depression should evolve predominant outcrossing because the transmission advantage of selfing is offset by inbreeding depression. 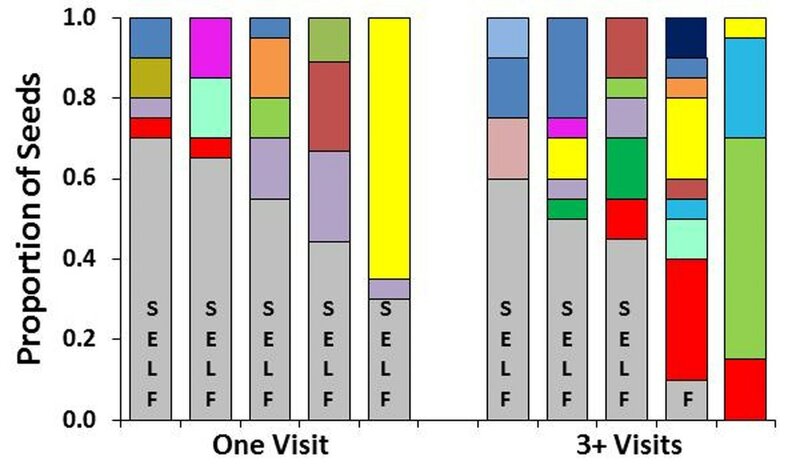 Since populations with intermediate selfing rates are common, researchers have sought to develop and test models that explore conditions favoring stable mixed mating. Several models have highlighted the key role of tradeoffs between siring success and selfing. However, most models ignore a fundamental aspect of plant-pollinator interactions, which is that pollinator movements between species often waste pollen by depositing it on flowers of other species. Such pollen losses reduce outcross siring, increase selfing, and lower seed production, changing tradeoffs and altering selection. Community context can therefore be an important driver of mating system evolution, yet it remains largely unstudied. The number of seeds sired per Mimulus flower declines rapidly with increasing display size (ANOVA P<0.0001). By contrast, female fitness is independent of display size. This provides evidence for pollen discounting in this species. 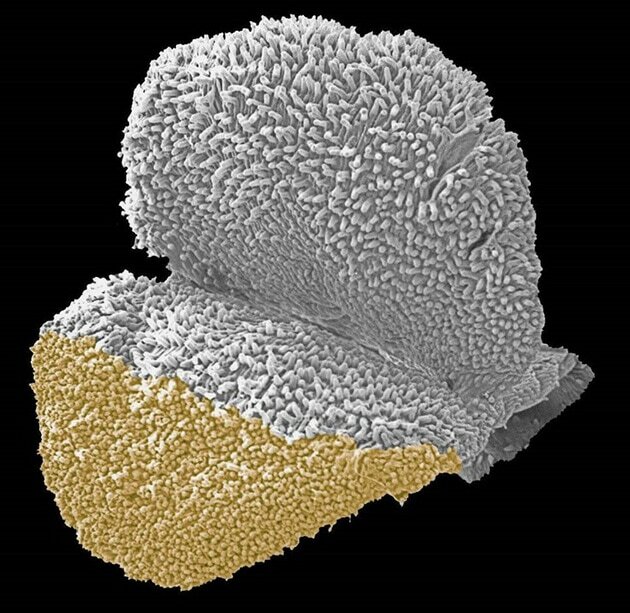 Mimulus ringens pollen grains deposited on a single lobe of the stigma following a visit by Bombus fervidus. Effects of Lobelia on Mimulus seed production and selfing rate (Bell et al 2005). ​How does the loss of a frequent pollinator influence pollination success? Pollinator abundance is declining worldwide, and may lower the quantity and quality of pollination services to flowering plant populations. Loss of a frequent pollinator is often assumed to have negative effects on pollination success, yet this assumption has rarely been subject to experimental study. The magnitude of the effect, if any, may depend on the relative efficiency of the remaining pollinators, and on whether the loss of one pollinator leads to changes in visitation patterns by other pollinators. To explore how a change in pollinator composition influences Asclepias verticillata pollination success, Allysa Hallett (MS 2016) excluded bumble bees from plots in large and small populations of this milkweed species. She then quantified pollinator visitation rates, pollen export, and pollen receipt for control plots and for plots where bumble bees were experimentally excluded. Allysa found that exclusion of bumble bees did not reduce A. verticillata pollination success. Visitation by Polistes wasps increased markedly (293%) following bumble bee exclusion, especially in large populations (400%). Because Polistes wasps were just as efficient as bumble bees at pollen transport, increased wasp visitation offset lost bumble bee pollination services. This demonstrates that the loss of a frequent pollinator will not necessarily lead to a decline in pollination success. When pollinator loss is followed by a shift in the composition and abundance of remaining pollinators, pollination success will depend on the net change in the quantity and quality of pollination services. Please see the Karron Lab home page for photos of wasps and bumble bees visiting Asclepias verticillata. Polistes (wasp) pollinating flowers of Asclepias verticillata. Note the pollinia on each tarsus. Asclepias verticillata pollinaria on Polistes tarsus. ​Do co-occuring bumble bee species provide equivalent pollination services for Mimulus ringens? Do these species differ in their effects on the mating system? The composition of bumble bee species visiting our Milwaukee and Ohio study sites varies markedly from year to year. These species differ in body size, tongue length, foraging behavior, and frequency of grooming. Doctoral student Jason Vizelka has developed an elegant experimental design to quantify the effects of single visits to Mimulus ringens by different Bombus species. Jason has demonstrated that visits by these species deposit different quantities of pollen on Mimulus stigmas, leading to differences in the number of seeds per fruit. He has also utilized microsatellite markers to quantify mating system parameters, and has found that visits by these species yield strikingly different patterns of mate diversity within fruits. ​How do invasive co-flowering species influence the reproductive success of native species? Native flowering plants often share the services of generalist pollinators with invasive, non-native species. Rebecca Flanagan (PhD 2009; now Rebecca Delgado) devised an ingenious set of experimental studies which showed that an increase in the relative abundance of invasive Lythrum salicaria (purple loosestrife) lowered seed production of native Mimulus ringens. 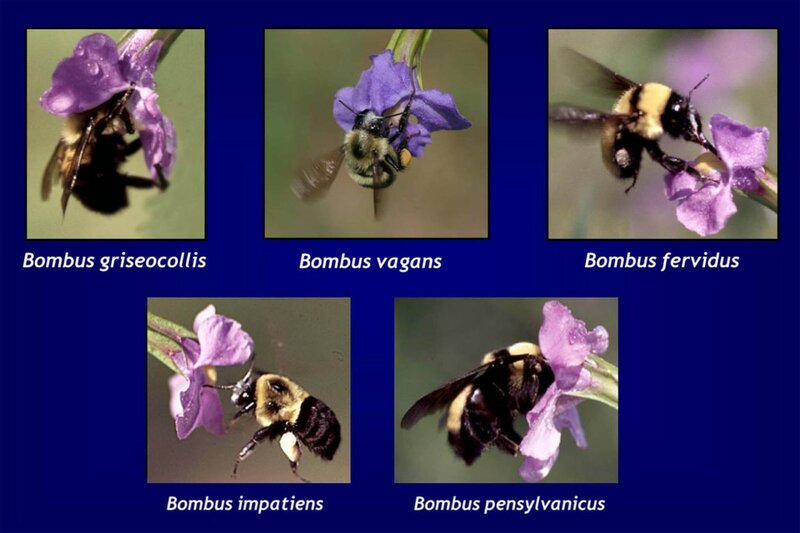 When a bumble bee forages on both species during a single foraging bout, much of the Mimulus pollen on the bee is lost as the bee grooms while foraging on Lythrum. The extent of pollen loss increases with the density of the invasive species, leading to a marked reduction in Mimulus seed set. Please see the Karron Lab home page for a photo of Bombus visiting Lythrum salicaria. Bombus impatiens visiting Lythrum salicaria. All images on this web site are protected by copyright. Please contact Jeff Karron if you would like to use them for non-commercial purposes.